Whenever I hear the word “London” the first thing that hits my mind is “London Baby!” I believe most of you known this phrase, but for those who don’t, this line was famously delivered by Matt Le Blanc who plays Joey Tribbiani in Friends. London is a land with many majestic places to visit and explore. But here’s the problem. Traveling from a country like Malaysia to UK whose currency is like 5 times bigger than ours, everything in London tends to look expensive. Therefore my trips to Europe are limited by the time I spend in each country. I’d rather split my money to travel to more countries in the same period of time rather than spending all of my savings in one place. I’m sure many can relate. 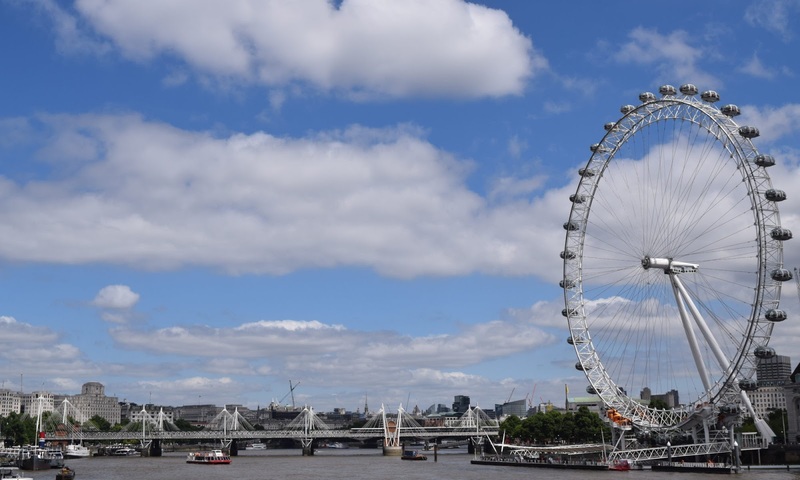 So here’s a treat for y’all – personally tested tips on how you can get the whole London experience in just one day! The best way to kick-start your day no matter where you are in the world is by having a hearty breakfast. There is a saying that goes “Eat breakfast like a king” and when you are in London, you’ve got to make sure you do it because the food there is amazing. Though you are often advised to go with the English Breakfast, I’d suggest something different. Get a cup of hot English Tea and have some pastries to go with it. The pastries in London taste very much different from what you might have locally. Have it hot, freshly baked from the oven together with your tea and you are set for your day’s adventure. Plus it might cost you lesser then an English Breakfast set. 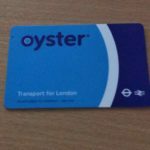 Now before you can start your travelling adventure around London, first things first, you need to get an Oyster Card. With this card you can access the tube and the buses. A 5 Pounds refundable deposit is needed to be paid to gain the card and you can top up how much you want. 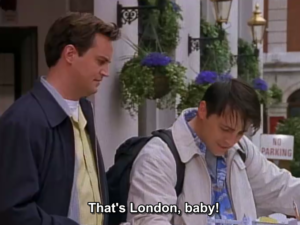 If you are going to be in London for just a day, I would suggest you just put in 10 Pounds. That’s because most tourist attractions falls under Zone 1 & 2 of London, and as long you are travelling within these 2 Zones, you can’t be charged more than 7.50 Pounds a day. The balance of the cash you topped up and the deposit can be refunded when you return your card, thus making it a good deal. Wherever you start your journey from, the first stop I would suggest you to go to is King’s Cross Station. You might have heard this name if you played Monopoly, but if you are a Harry Potter fan, I’m sure you are well aware that this is where Platform 9 ¾ Quarters is located. Yes, at the actual train station. Once you are in King’s Cross Station, just follow the signboards and you will find your way to Platform 9 ¾. I’d advise you against attempting a headfirst run at the brick wall though. Being a Harry Potter fan, visiting this place was one of the greatest highlights of my trip. 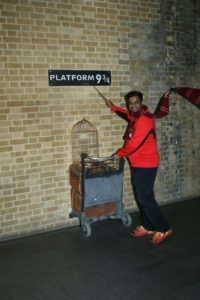 Here you can take a photo with a scarf of your favorite Hogwarts’s House while holding the trolley ramping into the wall. Next you can visit the Harry Potter store next to it. The store is filled many Harry Potter merchandise. If you are a Potterhead, you might just blow a hole in your wallet. 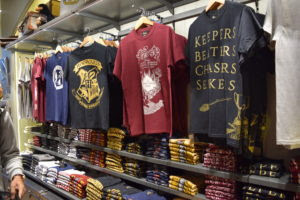 From T-shirts, to hoodies to magic wands and key chains, you can find all sorts of Harry Potter merchandises there. Being a huge Emma Watson fan myself, I couldn’t resist not buying a replica wand used by Hermione Granger in the film and it cost slightly lesser then 30 Pounds. Due to the queue for the photo clicking and the amount of time you might spend in the shop being awestruck, I would reckon you might spend about 2 hours here. Which gives you time to visit 1 more spot before you can stop for lunch. You will be spoilt for choice for where you can visit next, but my recommendation for you would be to visit the London Tower. 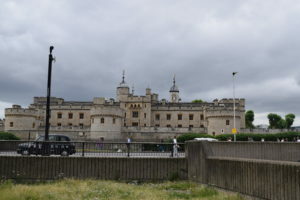 For history lovers, London Tower would be an ideal destination to visit and you can take some very good photos there too. You can ride the tube all the way to the station where London Tower is located and when you walk out, the London Tower is right in front of you. As you walk towards the tower, take a moment to appreciate the street art work by the sides which paints you a picture of the events that took place here. Here you have an option to go in for tour or admire its beauty from outside. If you are only having a day in London, I wouldn’t ask you to do the tour as it could take up your time, preventing your visit to other spots. As you walk out from the tube station, on your left will be London Tower and on your right would be a very beautiful garden. You won’t find a crowd but it is actually a very nice spot to read a book at. This place is actually a war memorial garden, so just take a moment to walk through it, take a couple of pictures if you want and pay some respect to those lost lives. By the time you complete this, I guess it will be almost noon. As your breakfast was heavy, you wouldn’t get too hungry yet but you might want to grab a little bite as you still have a long day ahead. For lunch I wouldn’t really suggest anything fancy nor spend too much time on it. Instead you could just spend a couple of minutes getting a hot dog at a food cart and be on your way to your next spot. 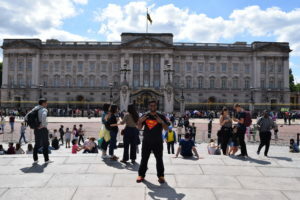 You could be excused for missing other spots during your visit to London, but not going to the Buckingham Place isn’t one of them. This most iconic royal place is a must visit place. Once again you can go all the way there through the tube and once you get off you will need to walk through a beautiful park for a couple of minutes before you reach the gates of the palace. Take a minute to just savor the moment that you are here. There might be some tour guides there explaining about the palace history. I was lucky enough to catch a story about how a guy broke into the Queen’s bedroom to ask her for a couple of cigarettes. Just walk around the palace, there’ll be many places to take photos at. One of the best things you can do is just to sit, let time pass by and live the moment, enjoying every bit. Before you take tube to the next station, you might want to consider once again just lying down at the park or snapping some photos of people around there. Next you can ride the tube all the way to Westminster Station as the rest of the places on my list to visit revolves around this station with walking distance. As you come out from the station the first thing you would spot is the famous Big Ben. From there you can walk towards exploring the House of Commons & Westminster Abby. If you walk across Westminster Bridge you would come towards the Eye of London. It will be a cool idea to ride it and get a bird eye shot of London. There are more attractions around there life Shrek’s Adventure & Sea Life London Aquarium. If you come back across the bridge you would be able to see the New Scotland Yard office and beside that there is again a very beautiful park to walk through. It leads you to the Guards Division Memorial and a couple of more attractions. By the time you complete walking around all these places it will surely be late evening. 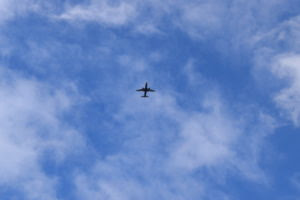 The good part about visiting London in the summer is that it doesn’t get dark until 8 p.m. Once you are done you can head back to where you’re putting up the night or off to the airport for your next destination. 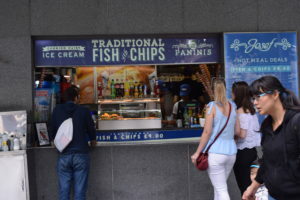 The one last thing you should do before you end your London Trip is to try their Fish & Chips with beer. After a long day of walking around and a light lunch, this meal is the perfect dinner to have and sets you off right to a good long nap. See you again on my next travel and I end this article with the following quote.